Mitakihara University is known around the world for continuing a long tradition that goes back more than decades: it's none other than Homecoming Week. This year's theme is "We Stand On Guard For Thee." Danleigh Marin-Bessey, the great-grandson of Tomas Marin, the Mega NRG Man and a member of The Society, returns one more time as this year's Homecoming Chair. Marin-Bessey is a senior history major, born and raised in Mitakihara Town, B.C. "Happy 200th birthday, Canada," said Marin-Bessey at the promotional event at Madoka Square. "This year's Homecoming Week commemorates the Canadian Bicentennial and salutes 200 years of this great nation many of us call home. We invite all Canadians to come to this year's homecoming and celebrate this great moment in our nation's history." Returning to the Homecoming Program after a long layoff is the Battle of the Bands, which will be sponsored by Sony Music, Pony Canyon and DefStar Records. A number of other events will also take place leading up to the Homecoming Game against the Notre Dame Fighting Irish on October 1, 2067 at 6 p.m. PT/9 p.m. ET. The game will be televised by City, TVA Sports, ESPN, NHK and BBC. Tickets required: $60 for adults, $40 for students and $25 for seniors. Tickets can be purchased directly through the Mitakihara Box Office by phone at (250) 4MADOKA or online at the box office website. 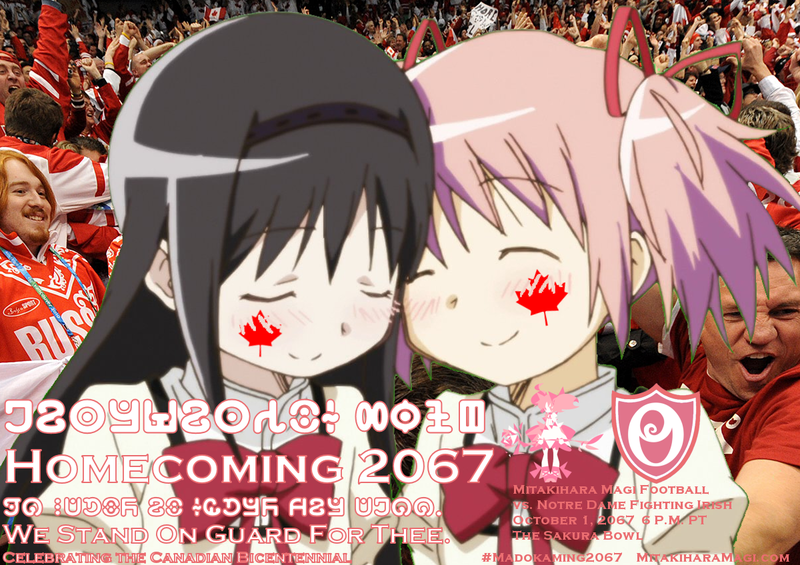 Following the Women's Volleyball game vs. British Columbia, the 2067 Mitakihara Magi Football Team will be introduced. Speeches by head coach Tatsuya Kaname, offensive team captain Dee Dee Sonoda, defensive team captain Terrell Ameobi, athletic director Shizuku Minami and university chancellor Honoka Kaname will be made. Pack a picnic and set up a tailgate with your friends prior to the Mitakihara-Notre Dame football game. The Madoka Tailgate Area will be located inside Stade Sakura Bowl Gate 10. Cars can park here for $50, payable on-side. Tailgate is permitted for 2 hours prior to kickoff and for one hour following the game. Cheer on the Mitakihara Magi as they take on the Notre Dame Fighting Irish. A block of tickets for Madoka Homecoming is currently reserved through the Mitakihara Athletic Ticket Office. Tickets are required and cost $40 each, children ages 12 and under are free. Tickets can be purchased directly through the Mitakihara Box Office by phone at (250) 4MADOKA or online at the box office website.